Today marks the nineteenth anniversary of the late Steve ‘Steamin’ Clark’s passing. 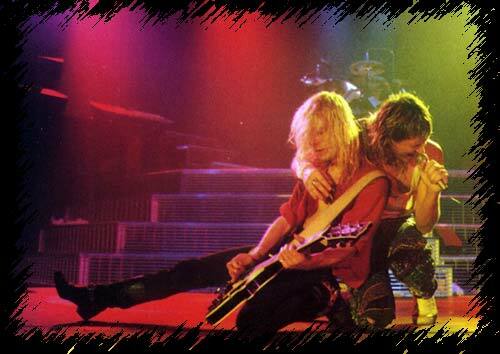 Just one year and two months before Tickets There were introduced to the mighty Def Leppard, they’d lost one of the most iconic, energetic, exciting and talented guitarists of the eighties. 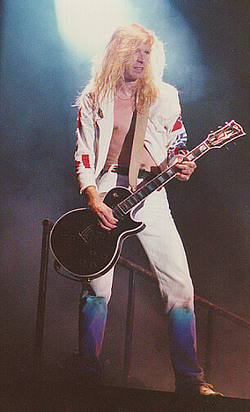 Steve was a member of Leppard’s classic line-up and was responsible for co-creating their unique, hard hitting sound that made albums such as High N’ Dry, Pyromania and the amazing Hysteria the classics they are. Steve was a total legend, plain and simple. His songs were top of their game, his playing was the essence of perfection and he rocked like a mother fucker. One of my true woes in life was never getting a chance to see the man play with the band but his music, like all fallen musicians, is still there and still thrilling millions of the bands fans every day. Steve was fond of a drink or two and you can be sure that we’ll battle this arctic weather to raise our annual pint to his memory. Below is a video tribute using live clips and Steve’s very own instrumental composition, Switch 625. You’re missed Steve, I hope they’re treating you well up there. Rest in Peace. This entry was posted on January 8, 2010 at 3:05 am and is filed under General Tickets There Blog, Music with tags Def Leppard, Steve Clark. You can follow any responses to this entry through the RSS 2.0 feed. You can leave a response, or trackback from your own site. This man was a legend. Wrote the sweetest riffs of all time, including Gods of War. What a hero. RIP Steve!